Therefore, the ideas herein are presented as a working outline of these thoughts. Lately I’ve been studying the topological transformations of our communication networks as a function of technological evolution, and attempting to understand the impact that this evolution has upon both our individual and collective phenomenological experience of reality. For the same structural reasons that connecting one’s aorta directly to the capillary system would cause immediate death, or connecting all of one’s neurons to each other would result in seizure (and death), we’re now experiencing a kind of phenomenological death of the sovereign self due to a paradigmatic shift from a network topology in which short-range connectivity dominated one’s phenomenological landscape, to a landscape in which mid and long-range network connections (between individual leaf-nodes and densely connected hub nodes) assume the role of primary phenomenological attractor. This of course leads to a form of fragmentation-of-self in which one finds themselves attracted to a smaller number of strong phenomenological attractors at a distance, as opposed to a more distributed (albeit homogenous) meshwork of local phenomenological attractors. We may conceptualize this phenomenological tension as the delta between how perspectives differ and the mechanisms by which perspectival agents resolve the internal and external–i.e. psychological and social, respectively–interference patterns generated by their asymmetries of perspective. Here again we see a massive topological transformation in the Internet age. Whereas social and technological constraints governing the necessity of physical interaction and reciprocity dominated human phenomenology prior to the Age of Communication¹, the capacity to communicate non-locally began a shift in which the dominant edges of the social graph inverted: rather than densely connected local communities connected by tenuous fibers of inter-cluster flow, we now find ourselves in a phenomenological reality where it’s more natural for me to write this note to a set of loosely connected people on the Internet than it is for me to walk upstairs and say hello to my neighbors. Now I’m certainly not the first to notice these tensions and transformations, though our generation may very well prove the first generation capable of standing sufficiently apart from the pattern, empowered with sufficiently powerful tools to make potentially falsifiable statements about the transformations in question. In other words, this area appears to provide fertile ground for the rejuvenation of philosophically informed scientific inquiry. Such a form of inquiry may be juxtaposed against the work of those who first sensed these transformations from within–and therefore expressed an inside-out view of–a context in which Common Knowledge placed Capitalism as Such upon the esteemed pedestal of arch-nemesis: namely philosophers such as Deleuze, and to a lesser extent DeLanda. 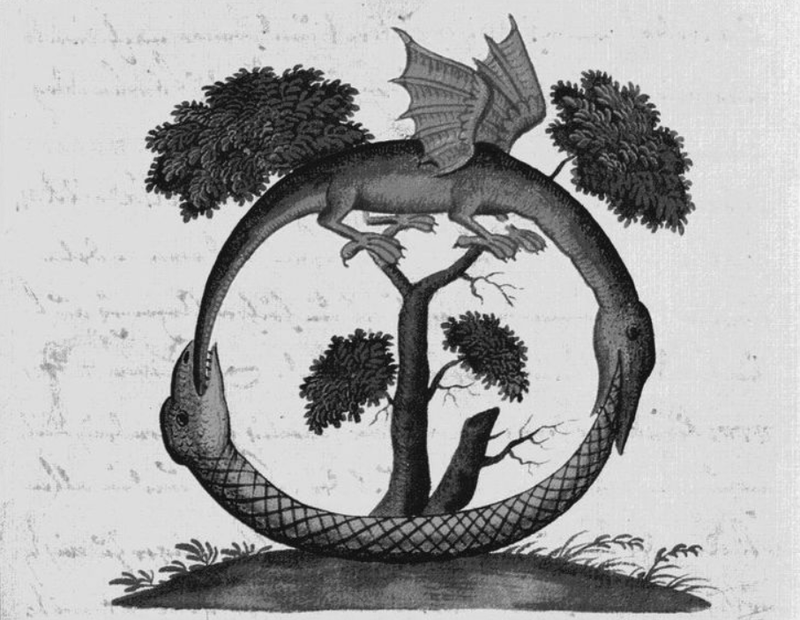 Instead, by adopting an increasingly processual ontology, and embracing the emerging tools of complexity science, we may honestly step outside the ironically dichotomous frames established by a group of philosophers who presumed to demolish the binary. We may step beyond the provincial lens of analyzing complex emergence in deep-time through the ever-so-shallow lens of the capitalist bogeyman. This allows the philosopher and scientist to at once recognize their embedding within a context-sensitive manifestation of these deep patterns, namely the behavioral implications of specific economic formalizations, as well as generalize beyond the limited scope of such formalizations, connecting their point-manifestations to scale-free patterns governing flow throughout network systems as such. Hence we obviate the temptation to descend into the black-hole of sophistry–called by another name, the dark heart of postmodern philosophy–by embracing the notion that the subjective experience of the individual and the emergent structures that feed back upon individuals in the form of constraints are two legs of the same dynamically stabilized, evolving processes. Yet how does this relate to our initial question of communication systems and their evolution across time? Well, I hope to nip a particularly unhelpful perspective at the bud. It is a perspective currently put forth as a metaphor for present cultural evolution, and must therefore be contextualized before too many minds adopt this relatively superficial category system. The perspective in question is that of smooth vs striated system dynamics, as articulated by Gilles Deleuze. Essentially, Deleuze draws a distinction between sedentary systems that come to be dominated by structured hierarchies (striated), and highly dynamic systems that must operate upon fluid (smooth) landscapes in which the network structure of the agents within the system also act as a primary feature of the landscape itself. In his writing, he establishes a conceptual symmetry between striated systems and the uniquely Western game of chess, and contrasts the game’s dynamics with the smoothness of the Eastern game go. A full description of these metaphors lies beyond the scope of this note, but the curious will enjoy this summary. 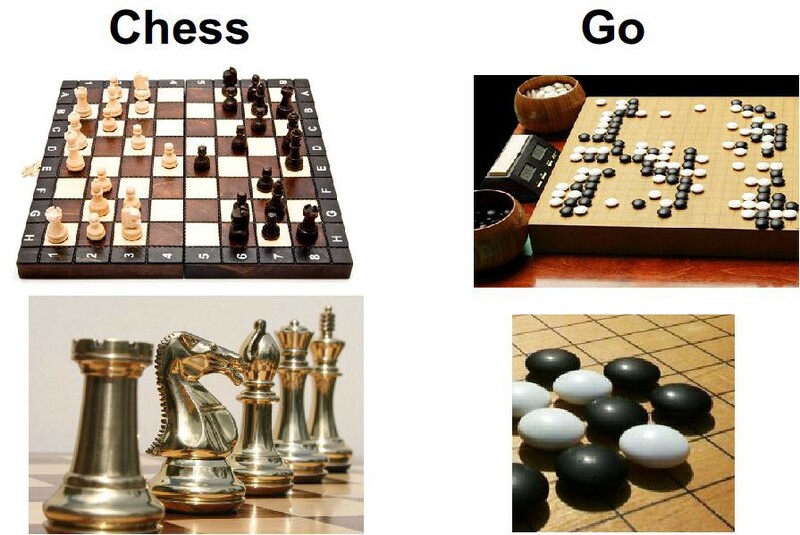 Not chess or go. Chess and go, intermittently as they co-emerge from a Hive. Many who explain this game (at least from the Western perspective) tend to compare it to chess. 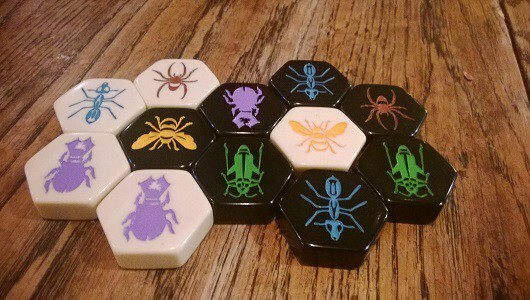 This is likely because the freedom of movement for different insects types is governed by unique rulesets, similar to chess. But this parallel with chess overlooks the more interesting features of the gameplay that parallel go: namely that the pieces themselves form the territorial boundaries (i.e. the evolving high-dimensional boundary of the game’s possibility space) within which the game is played. Therefore there exists a constant tension between the shape of the dynamically evolving hive and the dynamics describing how the conscious actions of individual insects are simultaneously constrained by the territory created by their past decisions, and yet, to the extent they’re capable of simulating the complex interactions between agents qua agents and agents qua territory, each agent also holds the potential to alter the evolution of the system’s future constraints. In other words, Hive’s gameplay is case in point that the dynamics articulated by Deleuze as unique to chess and go — hierarchically structural dominance and rhizomatic territorialization / deterritorialization, respectively— are more accurately represented as emergent modalities of a deeper processual stability that may give rise to situations in which either chess-like or go-like strategies represent the dynamically stable behavioral attractor given the path-dependent evolution of the unique game in question. Which brings us back to the question of our evolving relationship to one another given the evolution of the infrastructure with which we conduct our sensemaking. It’s tempting to view these technologies as “smoothing”, as Jordan Hall does in his 2019 situational assessment. And to an extent this is true. Insofar as the up-regulation of mid-to-long range communication flow enables more agents to become a part of the actualized constraints of a Hive-like game, we will see the “smoothing” of phenomenological space. In this state, the game will appear dominated by the capacity of agents to quite literally become strategic territory via their actions, therefore creating emergent islands of sensemaking within the turbulent fluid of non-sense. It is also true that from these islands, subsequent strategic initiatives may flow. But given that this shift constitutes a phase change atop a substrate that connects the dynamics of both emergent modalities, we must understand these initiatives more broadly as exploratory tendrils seeking to establish their own meta-stability, from which the next paradigm of striated behavior will emerge. We may observe this systemic inertia acting prematurely through individuals who believe that their emergent islands of stability represent sufficiently defensible territories: namely those most overcome by the venom of low-resolution ideologies. Such ideologies demonstrate the strong self-correcting tendencies within this system. While dynamic stability remains resilient under a large number of perturbations — providing a “home base” of sorts from which destabilizing excursions may depart, and to which they may return — the same underlying processes that give rise to the desire to depart eventually give rise to a desire to return home. And if that stable home no longer exists due to a removal of all phenomenological boundaries, as initially asserted in this note, the need for a replacement will come to dominate the behavior of all but the most nihilistic or psychologically robust individuals within a society. Thus we may view the growing attraction to islands of ideological stability as similar to the instinctual clustering of shipwreck survivors around the remaining pieces of flotsam. Like these lost souls, we find ourselves adrift in the rising tide of novel phenomenological complexity that flows from our rivers of hyper-connectivity. Alas, such survivors’ days are numbered, absent outside intervention. And herein lies the paradox of this behavior: the probability of outside intervention is zero. We’re part of an emergent system, and therefore if the ship goes down, no one will come to the aid of humanity. Thus the primary questions within this time of extreme phenomenological transformation concern the kinds of structures that we may build from the fragments of prior stratified forms, namely: how might we create modes of communication–novel inter-perspectival grammars–capable of sparking cooperation amongst the different clusters of survivors, otherwise adrift and on the clock? Perhaps such modes of creation and cooperation will prove sufficient for us to float upon an emergent raft — ant-like — to a novel island of stability. And upon this island we may again tap into our capacity to impose meta-rational structure upon a world that — while more complex than we’re presently capable of handling — will feel manageable to those who’ve survived the phenomenological experience of our present cultural shipwreck. Let us define the advent of the communications age as the moment at which humanity developed the capacity to directly communicate–albeit at a low bandwidth–at or near the speed of light (excluding fire signals / mirrors / etc). I would date the beginning of this phase shift to the mid-19th century, with the advent of the telegraph.